LA, Chapter One: George Clooney Is Handsome And Helpful. 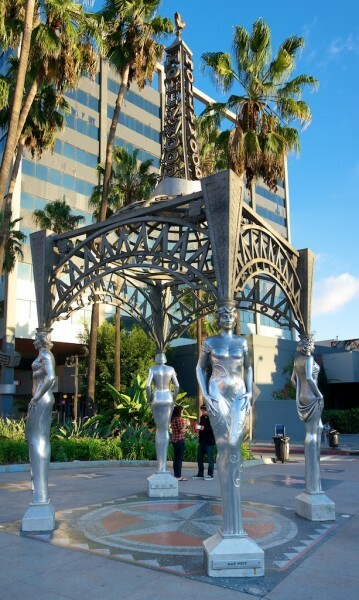 The Hollywood La Brea Gateway. A dramatic steel gazebo in which the four columns are life-sized statues of four legendary screen women: Mae West, Dolores Del Rio, Anna Mae Wong, and Dorothy Dandridge. With concrete spikes driven through their skulls. I never seem to get around to blogging about my trips and I don’t really know why. I suppose it has something to do with the fact that I try to pack a lot of livin’ into those two to seven days. And when I’m not livin’, I still usually have to do a lot of writin’. Then there’s sleepin’. Bloggin’ seems to land buttered-side down. Particularly because I sometimes make the mistake of taking it too seriously. So I’m going to try an experiment. I’ve set a ten-minute countdown timer here on my iPhone. I can write about as many topics as I want, but I have to abort after ten minutes on each. Chapter One: George Clooney Is Both Very Handsome And Quite Helpful. Speaking of experiments: I decided to go full-out and commit to the idea of packing light. $25 for a checked bag? Each way? $15 was my Grumble But Play Along price. For $25, I was willing to modify my behavior. A five or six day trip is normally the worst packing situation imaginable. I’m right at that margin. Usually, I can fit everything in one carryon if I throw some important things out, or I have to take the larger bag and resign myself to spending all that money for a half-empty piece of luggage. This time, I was determined: under no circumstances would I take more than my one hardsided rollerbag and my laptop bag. The only non-negotiable items were socks and underpants, of which one really must have one set for every morning. Other than that: if there was any doubt about taking (n) or (n-1) copies of any item, I would favor (n-1). I also did something that’s always seemed absolutely insane: I rolled up every last article of clothing into tight individual tubes. Even the dress shirt that needed to stay nice. I’ve seen demos of Master Packers who insist that you can travel for two weeks out of one carryon by using this technique. I imagined them spending that whole time looking like their outfits had been designed by someone who’d spent most of his life working with accordions. Well, gorblimey: it all worked out great. Despite the fact that I needed to pack a tripod in there as well, despite the fact that I had to wear business-formal to a special club later in the week. It all fit in nicely and the lid closed cleanly. I didn’t even need to undo the zipper on my laptop case that doubles its capacity. It was like I was headed out for a weekend, instead of the better part of a week. So that’s the new mission rule: one bag, period. I think it’s encouraged by the fact that now, it seems less like an inconvenience and more like a logic puzzle. It’s like playing Tetris with your clothing. The big advantage of rolling your clothes, as I see it, is that it allows you to form a dense two-story layer of solid clothing at the bottom of your suitcase which fills every nook and cranny. When you combine this with a motivation to “win the packing game” by asking yourself the hard questions (“How about just two shirts?” “I should wear this v-neck sweater on the plane instead of packing it; it’s thick cotton”), miracles can happen. Also helpful: seeing “Up In The Air” three or four times on HBO in the past month. George Clooney’s character travels 350 days out of the year and there’s a marvelous scene in which we just see how efficiently he packs. And then there’s a second scene in which he scolds a newbie for her gramma-style American Tourister and mercilessly “edits” her selections to fit into a brand-new rollerbag. I reiterate that George Clooney is a very handsome man and as such, he can be trusted to know what he’s talking about. It also made me think slightly more favorably about these new baggage restrictions. Before the airlines tacked $50 onto the cost of every ticket, I tended to overpack. Why take just two extra shirts when three would offer me some more alternatives? A big monetary disincentive forced me to be more careful. That’s probably the only real way that we as a country are ever going to move away from oil. Would I drive my car as frequently if there were a 100% surcharge on every gallon of gas? Probably not. I’d rightly say that the added price was insane and and outrage…but ultimately I bet I’d realize how much room there was for me to cut back. Done! With 30 seconds left on the clock. I like how this is working out. Rolling your clothes into tubes? That’s crazy talkin’. Could you make us a packing video? I don’t know that I could TYPE that in ten minutes, let alone arrange the words in such a pleasing order. Ah ha! was that ten minutes during the recent switch from daylight savings time when we had an extra hour? If so the ten minutes would actually have been during the extra hour and as such not exist and therefore would not have actually been a blog post. Very clever Mr Ihnatko. Once again you have sucessfully dodged bloging about your trip! But seriously, that was really good. really enjoyable read but I am left wanting more! I scan my RSS feeds and see that a tech journalist is visiting LA and has nice things to say about a movie star. This could be an interesting slant on the denizens of entertainment. oh, wait, bait and switch. The journalist didn’t run into the movie star in LA, instead he saw a movie. I work in development finance and travel internationally on a regular basis. I’m not at ‘Up in the Air’ level travel proficiency yet, but am well on my way. I aware this sounds extreme, but two pairs of Exofficio underwear that you can easily hand-wash and air dry will allow you to cut back on the underwear count. Makes a big difference when you go on long trips! Packing – a series of tubes. Brilliant! Excellent blog and all in just nine and a half minutes. Amazing. Another great packing tip – pack bulky clothes into sealable “vacuum” bags (Target or Kmart cheap) and you squash, say a down jacket, down to 20 mm thick by sitting on it. Close the valve. Fluffs up fine when you open it up. Clearly you have rolled your sentences into tubes and packed them densely into the time allotted! As always a pleasure to read, informative and amusing. How did you type that much and so eloquently? I wanted more but a post is much better than none. Did 10 mins include editing? Bravo Bravo! Travel space bags are the bombdiggity. It removes all those pesky air pockets in between the clothes there by fitting more into the bag. Must say, you seem to have the traveling thing down to perfection! Thanks for sharing your tips for rolling clothing, and thanks to the commentators who have shared their recommendations for using Space Bag To Go Bags. Just so everyone knows, the to-go bags don’t require a vacuum, but still eliminate extra air in your clothing. Feel free to visit http://www.SpaceSaversCommunity.com/products to learn more. We also have packing tips that may help out on the next vacation. Previous PostPrevious You know who ELSE hated apostrophes? Next PostNext An Exciting Announcement from iTunes tomorrow?